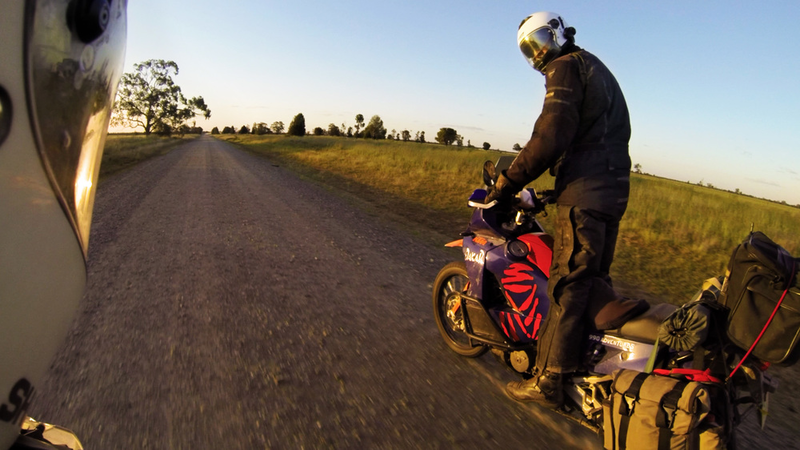 Late on Saturday 4 October Ian Horsborgh lost his life after succumbing to internal injuries caused by crashing his KTM690 after hitting an emu in Central NSW. He survived the crash but died after he was taken by air or road ambulance to hospital. He was riding with fellow BMW Touring Club Member Dave Beers who was following some distance behind to avoid dust and didn't see the collision with the emu, which was dead when Dave arrived at the scene. The details may become clearer soon but no doubt Ian will be talked about over coffees, beers and campfires over the years ahead. How could such a giant man with the hugest hand I have ever had the pleasure to shake have skin so soft? Yet he was always the first to get his hands dirty when a tyre needed changing or deal with a problem, as happened at a remote stop in the Barrington Tops on the 2014 Karuah Rally, a KTM990 was leaking fuel in a steady stream after a rock pierced the tank, Ian was the first to rush over and quickly dismantle half the bike to stem the flow, much to the delight of the owner who didn't know Ian or seem to know how to fix it. He didn't mind having a go at things he wasn't familiar with either. It was a big step to edit the Newsletter of the BMW Touring Club of NSW with a fabricating background. Ian fixing someone else's puncture again. He was always someone I looked forward to seeing when I heard his bike roll up to the house. Usually concocting something that was interesting to hear or see. Anyone who saw his KTM 690 would know what I mean. Sam from Australasian Dirt bike Magazine was interested in featuring his bike after a quick look and seeing mod after mod but a time couldn't be worked out before the Off Centre Rally for a photo shoot and Ian never seemed to stop riding since he got back from that epic trip. Ian didn't seem too attentive to the media interest, after all he had already been on the cover of Australian Motorcycle News a few years ago. He had a chuckle over that but Ian was the salt of the earth type, more concerned with helping his country mates at wheat harvest time or his weekly game of dominos with some of his city mates. A real highlight for me was hearing Ian talk passionately, over bluetooth intercom on the way to the Far Cairn Rally 2013, about wheat farming. Farming talk is usually a bit dry for me, but to hear it told like high roller gambling was fascinating without forgetting the human side to all that loss that goes hand in hand with such high stakes. Which brings me to Ian's wife Chrissy who I struggle to picture in my mind without a lump developing in my throat and without thinking of how my big crash could have changed my wife's life. It is too hard to comprehend the life left behind, yet we who ride keep on riding knowing we can only lessen the risks while pretending we have it all covered. Don't look back Ian, you did your earthly job and made a lot of people happy. "Are you still listening to my farming stories back there?" The Bike Culture in South-East Asia.